The recent Borough Council Core Strategy Exhibition in the Village Hall generated significant interest and a lot of strong feedback on the scale of development. A Village Development Working Group has been meeting regularly and liaising with the Parish Council to draft a response to the Core Strategy. The Working Group wishes to provide villagers with the opportunity to explore that feedback and discuss the different courses of action open to us. Even if you have been to previous meetings, we now want villagers to help decide the best solution for South Marston’s future. To reach as many residents as possible, we are running a series of three identical meetings at different dates and times of the day and hope you will be able to come to one of them. Each meeting will last less than 1½ hours with a presentation by a member of the Working Group, followed by a question and answer session. A questionnaire will be available and this will provide important evidence to both the Working Party and the Parish Council. The meetings will also help residents with their own individual responses to the Core Strategy. Please note the deadline for submitting responses to Swindon Borough has been extended from the 19th May to the 16th June. What will South Marston look like in 2015? Potential sites for wind turbines. We should comment as individuals and as a village. Want to do something different? Want to raise money where you live or work? 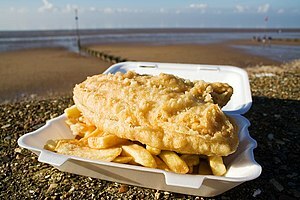 Want to eat Fish and Chips, while raising money for charity? Hold a fish and chip supper on Friday 20th May 2011 whilst raising awareness of spinal cord injury and supporting SIA’s information and support services. AEE Renewables invite all members of the public to attend a PUBLIC VIEWING of the plans for a SOLAR FARM in the parish of South Marston. You are invited by AEE Renewables to attend a public consultation which will take place from 12 noon to 7.00 pm. AEE Renewables are proposing to apply for planning permission to install a solar farm on land adjoining South Marston village. The land in question will still be used to graze sheep whilst harvesting the sun. Full details will be on view on this day and representatives from AEE Renewables will be there to answer any questions or concerns. Villagers are invited to a meeting hosted by the Parish Council in the Village Hall at 7.30 on the 7th Feb. to preview two key documents prepared by Swindon Borough Council. The long awaited Transport Report on the traffic impact and road plans for the Eastern Development Area, to include South Marston, expected to be available.